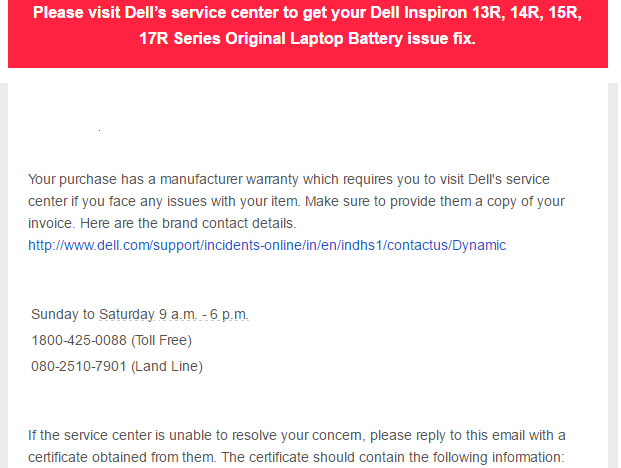 Recently on 8th of April 2017, I ordered a Dell Laptop battery for my laptop model number Inspiron 15R 5537 from Snapdeal.com, Below are the mentioned detail of my order. I got my order delivered on 13th April, and as the order was COD so I paid the amount to the courier service. After that, it has been just 10 minutes I have just open the product and I was amazed to see that battery is too short to fit into my laptop. So I decided to return it back, and I packed that battery as same as that come in the original packing. DO NOT BUY ANY PRODUCT FROM SNAPDEAL. THEY ARE BIGGEST SCAMMER IN THE MARKET. I talked to their customer executive and after 2-3 days I get to know that she writes a complaint that product is not genuine and the customer wants a refund. And after that, I got a mail that product is failed in quality check as the product is genuine and the product is shipped back to me. So what’s wrong with their customer executive? The battery is not coming fit into my laptop as seller described the wrong description on the product page. So now the battery has a no use for me. I talked to their customer more than 100 times out of which they didn’t pick up the phone 90 times. Their senior team always busy. And One time I connected with the senior team and he disconnect the phone after listening to my issue. So this is the service which is providing by Snapdeal. They are giving manufacture warranty. What I will do with manufacture if the battery is not coming fit into my laptop. Stupid Solution is given by Snapdeal. They have 7-day return policy but they are not returning my product or even not replacing. And the biggest thing is on Invoice there is no seller number or any email id on which I can contact. I tried to get details of the seller from Snapdeal and they straight away said, that they don’t store seller details and they don’t have seller number. WTF ? If you want to sell any product you must give your PAN , TAN mobile number email id everything to the company first. After that one company accept you as a seller, but in Snapdeal case they are mad. They are worst company every I have seen in my life. And now Snapdeal has sent back me the battery and now they are saying they will not return or replace the battery as you mentioned the wrong complaint. The battery has no use for me so I just wasted my 1749 Rs on this product. But I have all call recordings and everything and soon I am going to complain this issue in consumer forum and will make Snapdeal lets down on this issue. They just don’t want to listen to their customer. They just want to bring money from the people, they are 0 when compare to Amazon or Flipkart. I will suggest you, everyone that buy products from Amazon or Flipkart, don’t every buy anything from Snapdeal, I again warn you don’t ever buy any product from Snapdeal. They will cheat you for sure. As I already experienced this, so I suggest the audience of this website not to buy any Product from Snapdeal. I felt cheated from them and I will never buy any product from them. Soon I will share action of consumer forum on this issue. Also, I will run paid ads against them so they know the value of customers. Share your valuable feedback and if you have also faced any type of the same issue with Snapdeal or any other company just Email Us. We will publish your review on our website and on some of the biggest newspaper websites too. I also request everyone to make fake orders on Snapdeal and let them down. So that they realise customer value. Bro better go with amazon, they are too good in return or replacement. I also faced a same experience with Snapdeal. And now i stopped shopping with them. They are worst when it comes to customer satisfaction.